Free Astrology Reading: When Will My Tenant Finally Leave? My tenant is not vacating my flat even after nine months of notice. She is always coming up with excuses to stay put and is problematic to me and the neighbors. She is spreading false rumors about me to others. We came to know she and her husband are criminals. I am fed up with all the problems she is creating and told her to vacate as she was not paying the increased rent. Now her husband has passed away and she is asking for another 10 months to vacate. Will she vacate at least after that? Your tenant is represented by the 7th house* (see endnote) of “other people.” Mercury just entered a fixed sign, Leo, indicating that your tenant does not plan to go anywhere for as long as possible. The main difficulty is that you are not being firm and consistent in your demands upon her. Neither of your planets, Jupiter and the Moon, are in fixed signs – she is being much more stubborn and focused than you, which is why she is winning this little game. I also note that the Moon is in Gemini, a double sign, indicating your vacillation on this issue. Double signs go back and forth; in a loud-voiced double sign, there is lots of talk here, but it is all one step forward and one step back. The fact that the Moon is ruled by Mercury tells us she has the upper hand here, because of your hesitation to put your foot down. What is less clear is why you are having difficulty doing so. Would your fear of the malicious rumors she is spreading have anything to do with it? The Moon is in her 12th house of secrets and hidden enemies. The Moon has recently sextiled Mercury, likely your giving her permission to stay for another 10 months. The Moon’s next aspect is a sextile to the Sun, which afflicts Mercury by combustion. The Sun could be another person, perhaps a neighbor of hers, who is helpful to you in this matter, and it looks like you might be asking them for assistance. The Sun can also represent the government, and might show you starting the formal eviction process. If you want to get her out sooner than 10 months, your best bet is in about four months from now, as Mercury will conjoin the Sun in about 4 degrees. That is, you should start the process now, but November-December seems like a good time for her to leave. However, that is only if you start taking decisive action to get her out. I do not see her leaving of her own accord otherwise, and the chart does not clearly show timing for that. Why should she? She has you where she wants you. *Endnote: In traditional texts, tenants are assigned to the sixth house. However, remember that the sixth house rules slaves and those improving our household, so the old-fashioned kind of tenant is meant, where he works your land and generally does your bidding. In today’s context, that definition is not appropriate, and we would give most tenants the 7th house of business associates. If you do use the 6th house for tenants, feel free to share your experiences in the comments section. 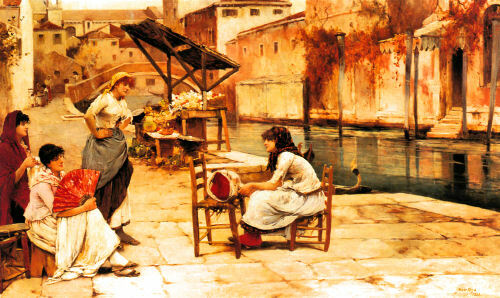 Free Astrology Advice: Horary Astrology – Who Spread Rumors about Me? Sometime back someone spread malicious rumours about me within our family. I could go on and on but in short the person said since I was close to one of my uncles, I was having a sexual relationship with him! Obviously it wasn’t true and thank goodness none of my relatives believed this. My mother was upset but in the end reason prevailed as I would never even think of anything of the sort. I did suspect it could have been a member of the family but couldn’t figure out who. Who was it? This horoscope interpretation is a little bit different than most, because we are not looking at the first house which describes you, but rather the 12th house of hidden enemies. These would be the enemies that afflict you by hidden means, and spreading evil rumors is a typical 12th house activity. 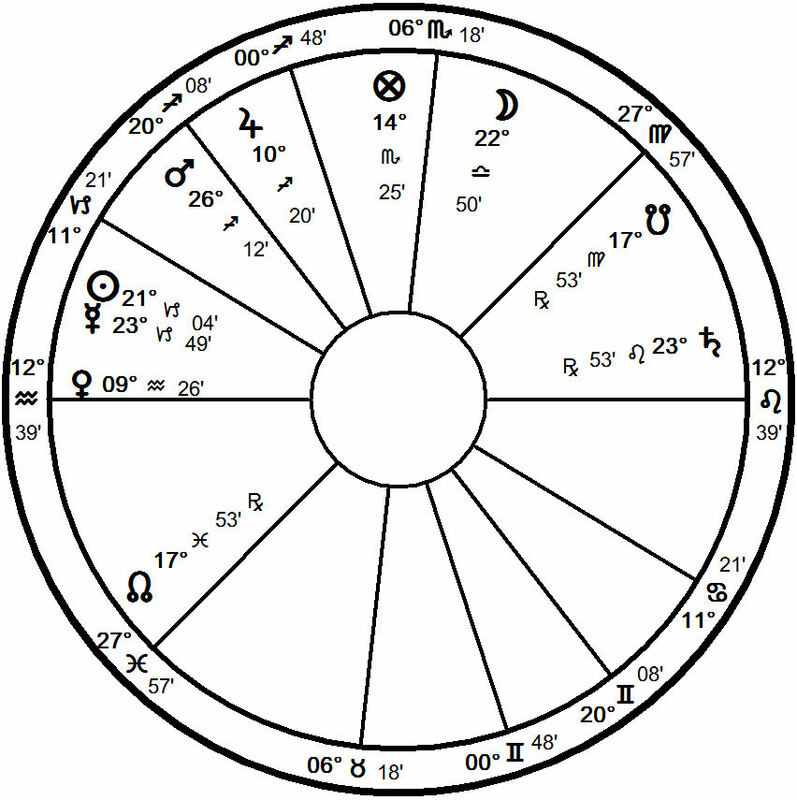 The 12th house is ruled by Saturn in Leo, retrograde in the seventh house. Now, Saturn in Leo is in its detriment, where it is quite malicious, and being retrograde only makes it more so. The fact that it is in the angular seventh house indicates that this person not only wants to harm you, but is able to do so (as you experienced). Saturn shows a tall and thin person, perhaps one darker in skintone or hair than is usual. In Leo, Saturn gets a little bit more flesh, so the person is not super skinny, but rather better built. Leo might also give a big hairdo. The trine to Mars might indicate some kind of blemish or imperfection on the appearance, especially on the head. Finally, Saturn is likely somebody older than you are. There are a couple more notes that you might find of interest. First, we see that the Moon, signifying you in this situation, is in the exaltation of Saturn, so it is quite likely that you think much more highly of this person than they deserve. In other words, the rumormonger may be someone you would not suspect. Second, Saturn is in the seventh house of just anyone, rather than the immediate family. This is one argument for the person being unrelated to you, or being only distantly related (farther than cousins, for example). They do have some kind of hidden grapevine with a family member, as we see that the antiscion of Saturn is right on the third house cusp of relatives. So it looks as though this rumor started outside the family and then was purposely conveyed to a family member. If you haven’t done so already, I would recommend tracing back the rumor through the family and seeing where it leads you. — Readers who wish to request a reading may do so by filling out the astrology reading request form on Nina Gryphon’s website. As we all try to recover from the shock of learning about Mark Foley’s predilection for underage boys, it occurred to me to take an astrological look at what was going on with Foley’s horoscope at the time of his resignation on September 29. I’ve always been very interested in the indications of a fall from grace, especially for people, like Foley, who ascended rather rapidly. We have to remember when we look at horoscope that the average person lives about 75 years. Therefore, very few of the things we see in the horoscope are statically determined. We can see both an ascent to fortune, as well as a decline in fortune, all in the same life. For some people, this happens more than once. I believe this is the case for Mark Foley, whom I would expect to have a fairly dramatic chart. We would expect to see great benefits on the one hand, and serious problems on the other. Mark Foley was born on September 8, 1954, in Newton, Massachusetts. Because we are looking at his public life, we will use the chart set for noon time. As I have demonstrated and explained on this blog, such as with the horoscope of Steve Irwin, these charts are highly suitable and highly accurate when you look at the public aspects of a person’s life. Because we are looking at Mark Foley’s career, we will focus primarily on the 10th house of fame and career. The ruler of the 10th house is Mercury in Libra, on the verge of entering the 11th house. This is considered a very benefic placement, as the 11th house is considered extremely positive, but Mercury itself is Peregrine, and therefore without dignity. As a result, all by itself, Mercury will not give very much fame, or the fame it does give will not be altogether positive. The cause for fame will be Venus in Scorpio, which rules Mercury’s sign, Libra. Venus is in its detriment in Scorpio, and it is conjunct Saturn, a malefic planet in Scorpio. The causes for fame will be bad ones, in general. And indeed, whenever Mark Foley entered the national newspapers in a big way, it was always about his sexuality, and rumors flew about his sexual orientation as early as 1996. By 2003, Foley aborted a political campaign because of increasing evidence indicating he was gay, which did not mesh with his conservative image. It should not come as a surprise that Venus and Saturn are in the 12th house of self-undoing, secrets and hidden enemies. Claudius Ptolemy, about 2000 years ago, wrote some choice phrases describing the sexual preferences of people with Venus-Saturn combinations. However, I am sure many people have Venus conjunct Saturn without preying on children; though no doubt Venus in detriment, Saturn Peregrine, and Mars sextile that whole mess does not help matters. 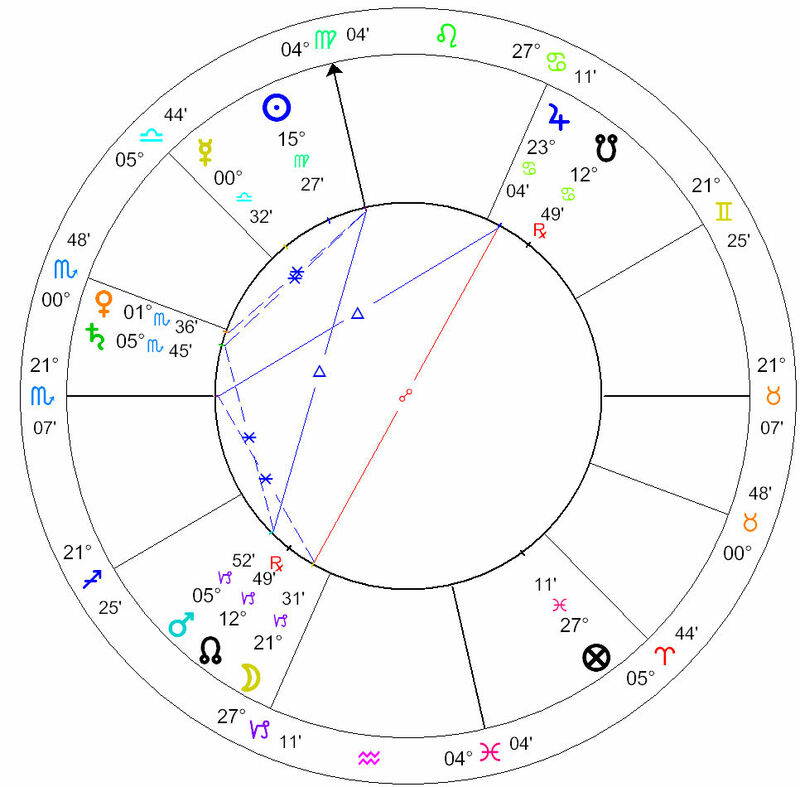 If we look at Mark Foley’s progressions for 2006, we will notice that his progressed ascendant entered Capricorn this summer, the sign ruled by Saturn conjunct Venus in the 12th house. The terms of the signs are especially important in progressions, and we see that in entering Capricorn, the ascendant also entered the terms of that detrimented Venus in Scorpio. Given that it takes 20 to 30 years for the Ascendant to go through a sign, its change of signs often portends an important time. Since Saturn and Venus are so debilitated in Foley’s natal horoscope, the chickens are coming home to roost. Mark Foley’s solar return for 2006 does not look auspicious, either. Mercury is cadent in the third house, from where it cannot do much good, though it is in its exaltation and sign in Virgo. The solar return ruler of the 10th house of fame is Mars, in its detriment in Libra in the fourth house. The moon, ruler of the first house opposes Mercury from Pisces, the sign of Mercury’s detriment and fall. This shows that Foley will be the author of his own fall from fame.